Before tonight's show, I had never really listened to King King and I'm really not sure why because by the time they reached the chorus of their opening song, '(She Don't) Gimme No Lovin'', I was absolutely hooked. Their brand of highly melodic Blues Rock is very easy on the ear and their relaxed, no-frills approach is extremely entertaining, and as a healthy portion of Rock City was very welcoming to the band and seemed very familiar with them, I've definitely been missing out. Alan Nimmo's wonderful voice made me think of an amalgamation of Steve Overland, Danny Bowes and Paul Rodgers, and his guitar playing was off the scale as we were treated to some stunning melodic, fluid and lengthy solos during 'Waking Up', 'You Stopped The Rain', Lose Control', the moody 'Rush Hour' as well as the ballads 'A Long History Of Love' and the immense 'Stranger To Love'. After witnessing a very enjoyable opening set, King King definitely have another fan to add to their ever-increasing army of admirers. I've always thought that Europe are one of the most interesting Rock bands on the planet because all of their albums have a different feel and you never know which direction they are going to take; in addition, they are still a massively entertaining live act. 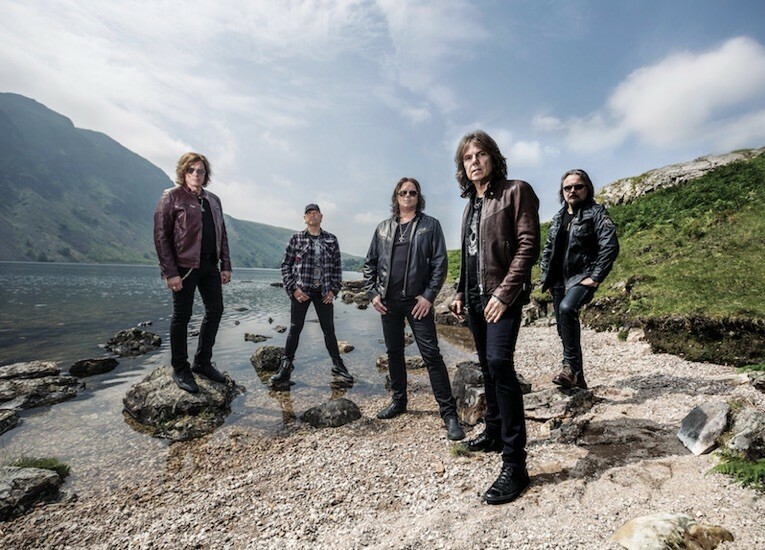 Thirty-plus years down the line and Joey Tempest still moves around like it's 1986, and while he may not be able to sing quite as high as he did back in the eighties, he's still a completely engaging front-man. As bassist John Levén and guitarist John Norum rarely strayed from their positions, the stage was Tempest's to dominate and only the low ceiling of Rock City prevented him from swinging his microphone stand around quite as much as he usually does. With eleven albums under their belt during their thirty-plus year history, Europe have an absolute wealth of material to choose from, and they don't always go for the most obvious selections. As this tour is still promoting 2017's 'Walk The Earth' album, they opened up with the title track and followed it with 'The Seige', but it was something of a surprise that the classic 'Rock The Night' appeared so early in the set, however, it incited the first big sing-along of the night. Quite a lot of Europe's songs tend to sit in the mid-tempo range so it was refreshing that some of their pacier numbers like 'Hole In My Pocket', 'Firebox', 'GTO', 'Ready Or Not' and the absolute classic 'Scream Of Anger' were interspersed amongst the more dramatic material like 'Last Look At Eden', 'War Of Kings', 'Turn To Dust' and 'Nothin' To Ya'. The ballad 'New Love In Town' is one of my favourite Europe songs and was a wonderful addition to the set alongside the evergreen 'Carrie', while the 'Out Of This World' album was surprisingly requisitioned for selections, namely the aforementioned 'Ready Or Not', 'Sign Of The Times' and 'Superstitious' – the latter incorporating a snippet of Whitesnake's 'Here I Go Again' to close the main set. Ian Haugland's thunderous drum intro to 'Cherokee' signalled the beginning of the encore, which then paved the way for the inevitable 'The Final Countdown' to blow the ceiling off Rock City and end another quite brilliant concert from one of Sweden's greatest exports. One thing's for sure, Europe definitely Rocked this night!